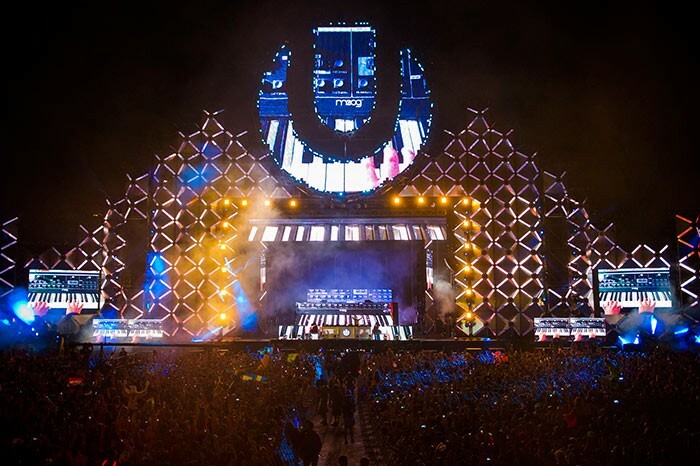 Lighting designer Richard Neville incorporated nearly 300 Robe moving lights into his design for the Main Stage of the 2013 Ultra Festival staged at Bayfront Park in Miami, which included 176 LEDBeam 100s incorporated into a custom stage set. The six day event is one of the highest profile EDM (Electronic Dance Music) events in the world. This year’s truly stellar line up over the two weekends included David Guetta, Armin Van Buuren, Tiesto, Avicii, and many more who rocked the house big style. Ultra 2013 was brought to a tumultuous close by the VERY final gig by The Swedish House Mafia … giving a characteristically show-stopping performance. 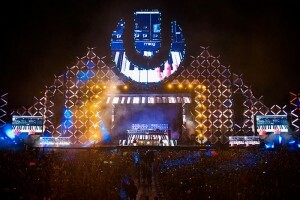 It is the first year that Sydney Australia based Neville, associate designer Alex Grierson and Neville’s company Mandylights has designed for Ultra, brought on-board by the event’s producers James Klein and Bruce Rodgers. 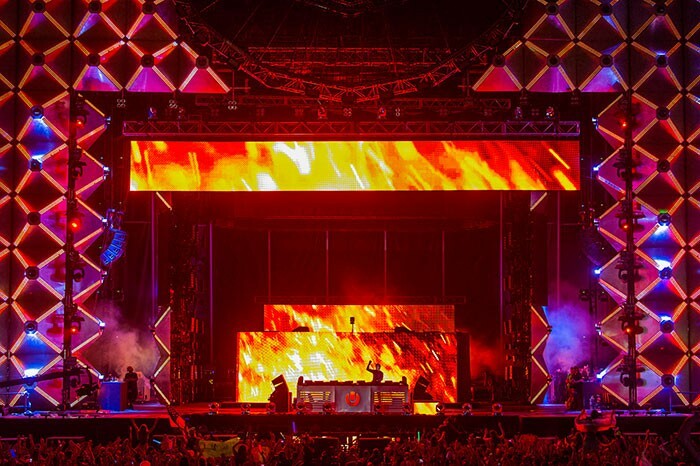 Neville is well known for his work designing lighting for EDM and stadium rave events across Australia, Asia and the Pacific Rim and he and Klein worked closely on the production design for the Main stage. He has been using Robe products for some time – specially the LEDWash series - and when confirmed for Ultra, the brief was to create something unique, different and truly spectacular with production values topping the agenda. The 200ft wide set was built by Tait Towers and included the 176 scenic pyramids each of which were clad in 40 panels of Tait’s now famous Pixel Tablets. Neville wanted a super-bright fixture to go in the middle of these and tested a number of options, including the LEDBeam 100, which were supplied for the trials in Australia by Robe’s distributor there, The ULA Group. Although the LEDBeam 100 was a new fixture to him, he was already familiar with Robe’s build quality through using the LEDWashes. A number of criteria swung it Robe’s way – the quality of the light output which is nice and smooth with no shadows, the range of "Solid" colours – which are consistent across the whole range of ROBIN fixtures - and the highly efficient colour mixing. The light weight was also essential for the way they were used and to enable 176 of them to be utilised on the structure without significantly adding to the rigging requirements! He also really likes the phenomenally fast speed of the LEDBeam 100. In fact it was so fast that during the visualisation stage of programming, they had to have one in the studio as the software could not keep pace with the physical movement of the fixture. "It’s been super-reliable and a great effect," he confirms. "As I knew it would be". Lighting for the Main Stage was controlled via four grandMA full size consoles, two active and two running in full tracking backup. In addition to the LEDBeams being controlled conventionally via the lighting desk, Neville and Grierson could switch to taking the ‘colour’ parameter from the show's Hippotizer media servers - mapped across the entire set structure and fed with video content - and produce some truly stunning and wild effects! In addition to the 176 LEDBeam 100s, the design utilised 25 LEDWash 1200s and 89 LEDWash 600s which were dotted all over the rig and used for what they do best – producing big bold slices of light and powerful waves of colour covering the stage and audience. 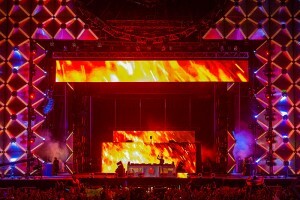 The Robe fixtures used on the Ultra Festival Main Stage were supplied by one of Robe’s leading US rental partners. The Festival was a massive success all round. Over 300,000 people enjoyed some of the very best dance music on the planet in a great outdoor setting. Robe Lighting Inc.’s CEO Harry von den Stemmen comments: "We were incredibly proud to have our products take on such an up-front role in the Festival and to be part of a world class international event – from both the performance and design perspectives. Above all, it was great to see the fixtures used in such an original and inventive way."